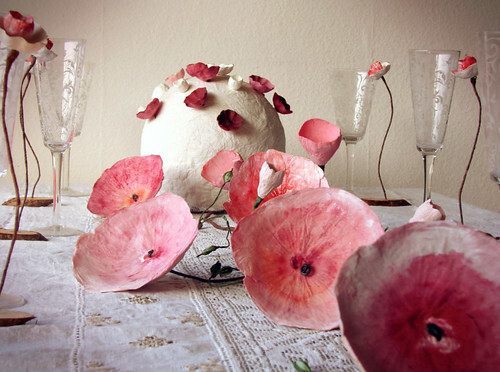 Not only does Alessandra Fabre Repetto of Eco Wedding Design create magical, eco-friendly wedding decor - paper flower bouquets, cake toppers, and tablescapes - but she is a talented designer of paper lighting and paper jewelry too. 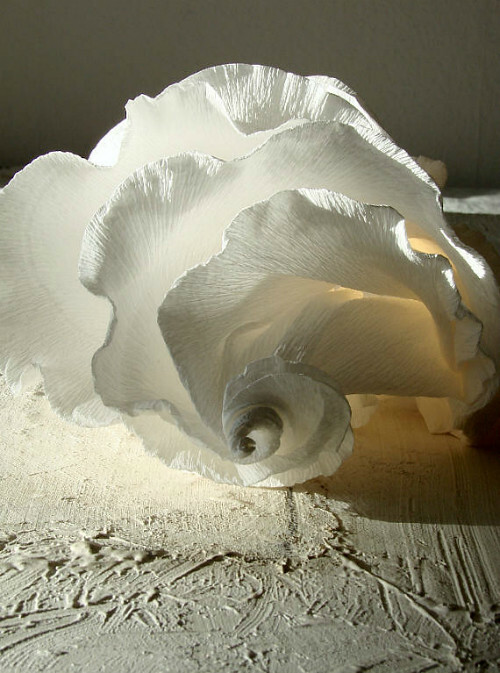 "Paper is a magical material due to its endless possibilities... it can be shaped, folded, rolled, crushed and painted, and each technique creates very different effects. Above all, it is a light material! While wearing even voluminous jewels, we barely realize that we are wearing them. 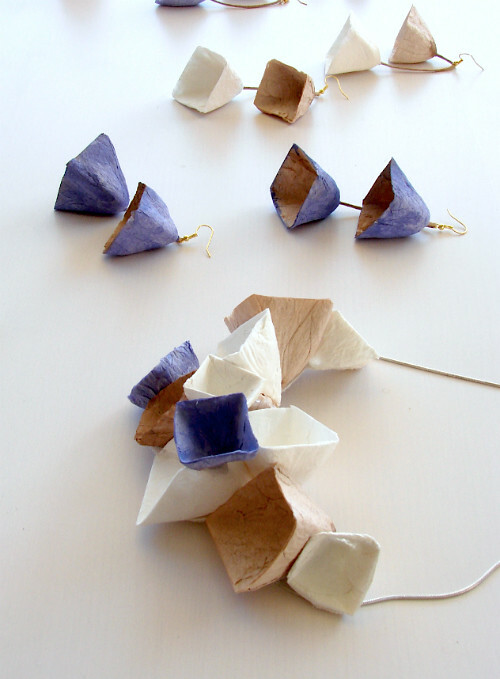 I have developed two main lines during my eco-designer career: the Flower paper jewels that I created about ten years ago and the Geometric ones that are more recent. All elements, whether in a soft flower garland or pyramidal shape, are made of papier-mâché, hand-shaped, then painted and assembled. Many of the jewels I make are unique pieces, while others are offered in different colors. Because they are handmade, none are identical. 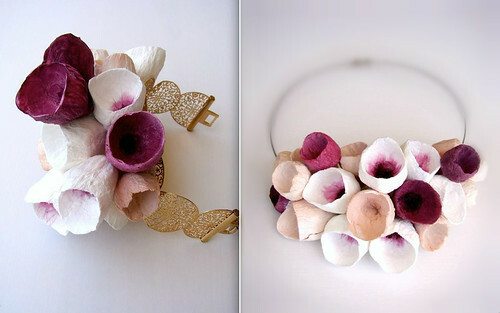 The Flower line of statement paper jewelry and eco-friendly wedding decor is romantic and delicate. My jewels are sometimes created for special projects, like this commissioned bridal wrist bouquet. 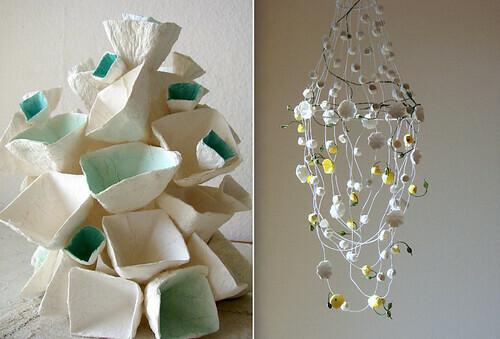 My inspiration comes from nature... flowers, tree branches, and sea bottoms. Using different colors leads me to interpret different styles. The Pyramid line is contemporary, modular, and fascinating for its endless possibilities. The single tiles are assembled one by one, each time in an unpredictable way. It is an assortment that calls to mind the architect’s work or children playing with building blocks. The growing awareness of environmental issues by engaged couples was my motivation to realize lines using long-lasting materials as a good and smart alternative to cut flowers that are seen at traditional weddings. 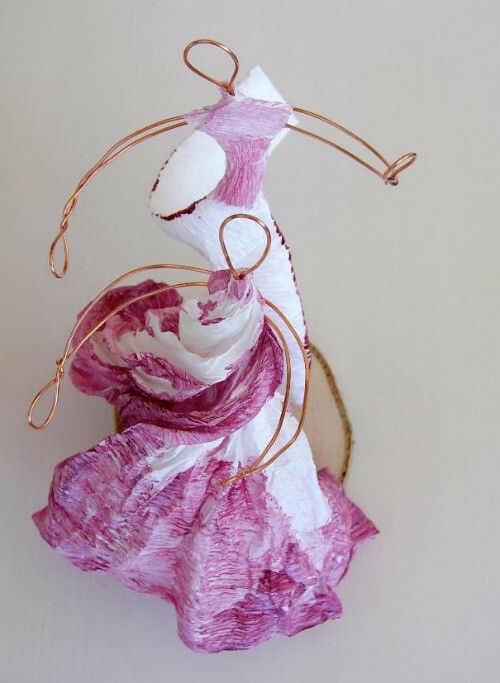 Bouquets, centerpieces, and decorations such as this Ballet Figures Italian crepe paper cake topper can live a second life after the wedding. 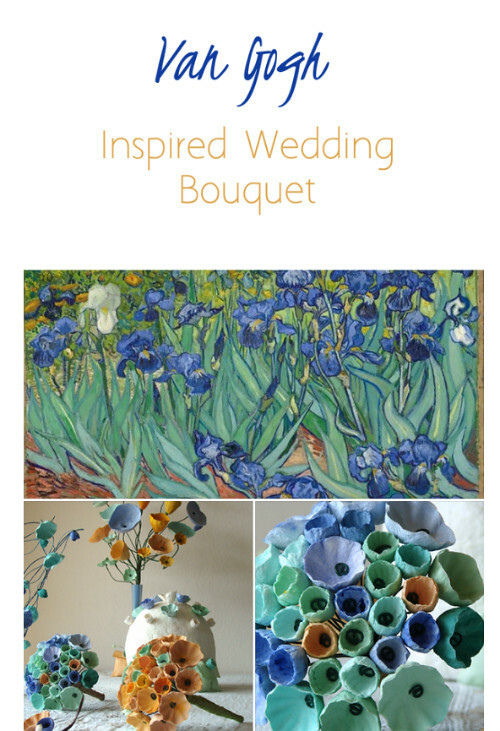 Standing paper flower centerpieces become design objects to decorate a home, shop, or office. The bouquet is often kept by a bride as a souvenir of the day. Even my Green Wedding place cards can be worn as brooches or bracelets. At the moment I’m developing a Lamp line made of different types of paper. These lamps are inspired by nature - tree branches, for example. 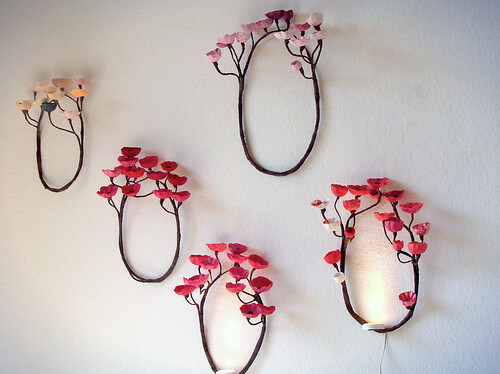 The Forest Wall Light is made of papier-mâché flowers and projects shadows on the ceiling, creating an enchanted world. There are Flower chandeliers too, and sea shapes like shells and corals." Visit Alessandra's Etsy shop. She blogs, is on Facebook, and can be contacted at alessandra.fabre@gmail.com. 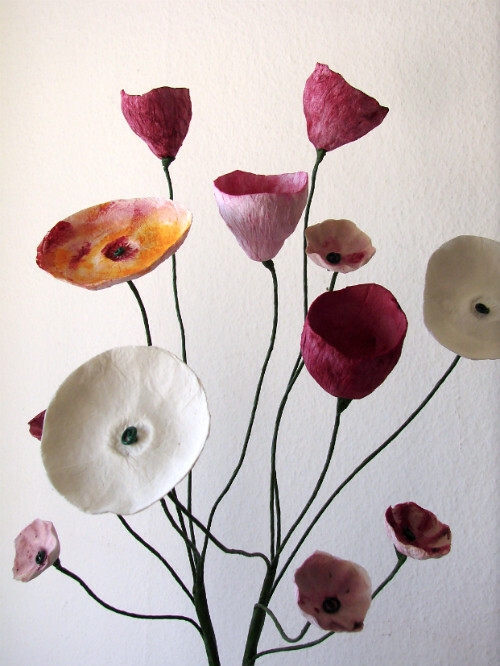 Learn about her start as a paper artist. 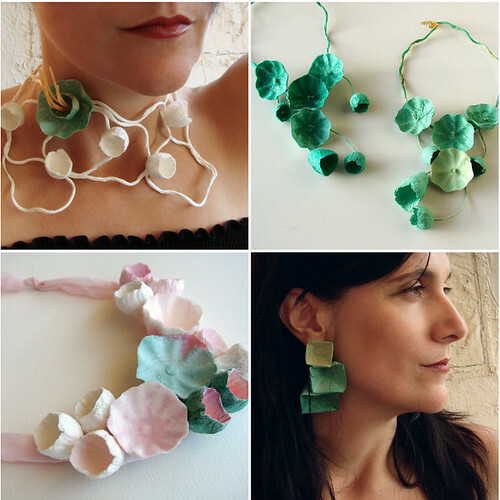 On a personal note, I've long been fascinated by the organic shapes and oh-so-pleasing color shades of Alessandra's floral paper machè jewelry... in fact, I have one of her necklaces and can verify that it is just as lovely in person as the pieces you see in these photos. Thanks so much Ann. I'm honored to see so many of my different works on my favorite site. Have a wonderful day! The colours and detail on the flowers are perfect. The jewellery looks light and pretty! My pleasure, Alessandra, and I agree, Suganthi! Adorei, é realmente muito bonito, obrigada por nos brindar com estas joias maravilhosas.